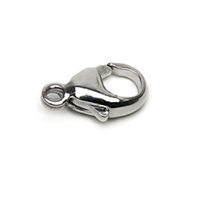 Sterling Silver Lobster Clasps, SSLC02, are polished to the mirror finish. They can be used for any do it yourself or replacement bracelet chains, beaded bracelets or necklaces. Lobster clasp is preferable for bracelets, which should be opened and closed often enough (daily). To use this clasp you do not need somebody help. If you are looking for a clasp, which is opened and closed rear, than Sister Hook Clasp is a better solution. It is impossible to open this clasp accidentally. To open Sister Hook Clasp when bracelet is on the hand you would need somebody help.